For this first-ever Spooks Weekly I’m going to rehash my favorite novels and short stories from my favorite author, Stephen King. Stephen King is truly a living legend. He is, by far, the greatest horror author of all time. There are many authors who write horror and are extremely talented writers, both living and dead (Dean Koontz, Shirley Jackson, and the granddaddy of 20th Century horror, HP Lovecraft, to name a few.) But ask any non-horror novel fan if they know any works by Stephen King, and I bet you they’ll mention Carrie, IT, maybe Cujo or The Shining. There are not too many genre writers who have crossover appeal and notoriety like he does. As a fan it’s hard to pick a favorite. This list isn’t inclusive and I’m going to leave out some classics, but I can’t summarize every single book. I’m going to talk about the stories that I’ve continued to pick up to experience again and again. When a first time author writes a book this good, you need to start with it. Carrie was King’s first novel. Way back when baby-me first decided I was going to start reading Stephen King, I consciously decided on Carrie. I had seen the movie of course, classic film that it is, (with the glorious Sissy Spacek) so I knew the general plot. 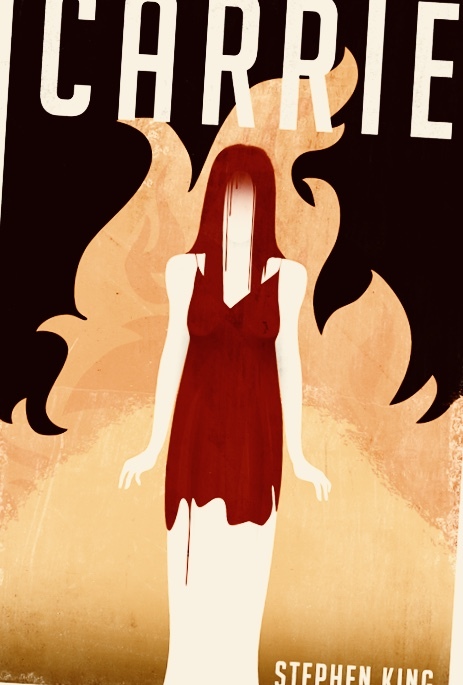 Carrie White is a high school senior and total social outcast. She overweight with acne and lives under the oppressive thumb of her religiously fanatic and abusive mother; a woman so extreme in her beliefs she never informs Carrie what to expect from her first period. No one has any clue that Carrie is telekinetic, including Carrie herself. Carrie gets her period unexpectedly in the gym locker room right in front of all the girls that frequently torment her. Her unexpected reaction (she thinks she’s dying) prompts a sort of mob-like reaction from the class as the girls verbally harasses Carrie and pelt her with sanitary products. The extreme duress this puts Carrie through as well as the onset of her period seems to finally allow her acces to her dormant telekinetic power. For punishment of the harassment, the gym teacher berates and assigns detentions to the class of girls, and some of whom eventually get their prom privileges take away. Chris Hargensen, the leader of the girls and one of the ones who won’t be allowed at prom, vows revenge on Carrie. With an unexpected invite to prom, a wicked plan from Chris and her boyfriend, along with the ever-looming threat of her fundamentalist psychotic mother, Carrie gets pulled to her breaking point and decides to use her powers to lash out at the world that has never been kind to her. When Carrie is standing on the stage having just been crowned prom queen and you know ,(as the reader), that the bucket of pigs blood prepared by Chris Hargensen is waiting there. Carrie is so happy and for once in her life she’s a part of something, and then the pig blood drops. Carrie almost killing everyone at prom and setting the school on fire. King puts so much detail in the chaotic scene, but it never once gets confusing or overwhelming. You can feel the terror and panic and the ruthlessness of Carrie, finally getting her revenge. My well-loved copy of IT. I’ve read it so many times that both the back and front covers are gone. To describe my love for this book would be akin to asking someone why their favorite food is their favorite. I can’t my love put into words and have it make sense. With IT, King weaves a wicked tale of terror and anxiety threaded with love, friendship and childhood. It’s terrifying. The prowess of King’s immense talent is showcased no better than in this book, and there are a few scenes that still leave me in awe every time I read them. This book convinced me that King’s talent is unmatched by any living author. He creates the villain of Pennywise, who is absolutely iconic and transcends generations. If you ask someone to name a character from Stephen King, (a non-bibliophile, someone who doesn’t read much, maybe) I will bet you they will mention Pennywise first. Maybe Carrie, maybe Cujo, but almost certainly Pennywise. Seven children that call themselves the Loser’s Club are brought together during the summer of 1958 to try to defeat something they refer to as only IT; a monstrous creature (that often takes the shape of a clown called Pennywise) that preys on children in their town of Derry and reemerges every 27 or so years to continue its terror. The seven friends manage to cut the monster’s time short, but make a pact to return when and if they hadn’t been able to truly defeat it. 27 years later, IT has indeed returned. The now-grown Losers Club returns to Derry to face the monster and their nearly forgotten childhoods, knowing that this time, they might not all survive. . The book flashes back and forth in time between the summer of 1958 and “present day.” (Which in the book is 1985.) King shifts the narrative between all seven of the main characters as well as some supporting and side characters, and I think it’s a pretty unique way of telling a story. By doing this he’s made the narration truly omniscient, which I feel is not something a lot of authors do. When Loser's Club member Ben Hanscom gets terrorized by IT, the winter before 1958, while walking home alone from school. When grown-up Loser’s Club member Beverly escapes her abusive husband to meetup with her friends as promised in Derry, once they realize IT has returned. Another scene when grown-up Beverly is back in Derry and exploring her old home, and she meets an old woman whom she soon realizes is not a woman at all, but IT in disguise. When the Loser’s Club, as grownups, descend into the sewers below Derry to kill It once and for all. I almost don’t know where to begin with this novel. 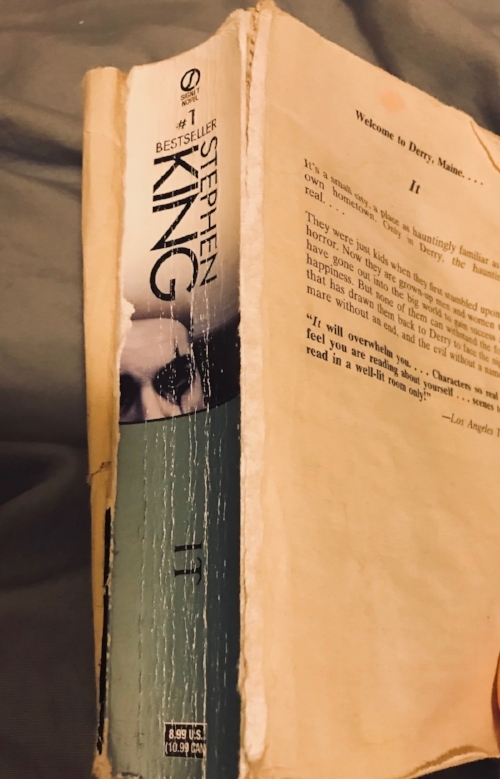 It’s not horror, but many of King’s books are not. I usually don’t like his non-scary novels, not because they aren’t well written but because non-horror doesn’t hold much interest for me. King has said that he started thinking about writing a book like this even before Carrie was published, but was overwhelmed with the amount of research needed and set it aside for later in his life. I am so glad he did; the details and execution of this book is a work of art. It does feature a bit of a supernatural tilt (obviously, since there’s time travel) but not so much that it takes away from the real meat of the story, which is historical fiction and a love story. Jake Epping is a high school English teacher in Lisbon Falls, Maine. His casual acquaintance is an older man named Al, who owns an old-fashioned diner. One day, Al asks Jake to meet him at the diner he owns, and Jake Is shocked to see that Al looks years older and sicker than he did the day before. Explaining, to a first completely incredulous non-believing Jake, Al explains that there is a portal to the year 1958 in his diner’s pantry, and that Al has been using it for years to purchase cheap supplies to keep his diner prices low. Al tells Jake that he just spent four years in the past (because no matter how long you stay in the past, you always come out two minutes after you went in in the present) and that Al was trying to make it to 1963 to prevent the JFK assassination. Unfortunately, Al came down with aggressive cancer and was unable to make it to that year, so he wants Jake to complete the task. Jake enters the portal, finds it to be exactly the way Al explains it to be, and sets off to change history. Along the way he assimilates into the late 50’s as best he could, establishes his identity, tracks Lee Harvey Oswald, and falls in love. The day of the assassination approaches, but Jake isn’t sure he wants to go back to the present. This book, again, isn't straight horror. But like much of King’s work there’s going to be scenes that make you feel uneasy. When Jake decides it's necessary to test the time travel and its ability to change the future before spending years in the 50's/60's. He decides to try and change the fate of an adult student of his. The adult is mentally challenged and tells Jake it’s because his alcoholic father came home one day when he was a child and killed his mother and siblings and attempted to kill him, but he survived. Jake takes the crazed father head-on in an attempt to change his student’s life forever and test the ability of the time portal to really change the present. When Jake gets in trouble with the mob. In order to make money in the past, Jake takes advice given to him by Al and bets on sports games. Obviously, games he knows the outcomes of from history. He is always careful and makes sure to lose sometimes, but still the mob catches wind of him and makes him pay, physically, for the money he lost them. The near-final scene, when Jake rushes to stop Lee Harvey Oswald. See, the thing is that you KNOW how this book ends. It’s fiction, but historical fiction. You know that Jake’s really not going to stop him, because that’s not what happens in real life. But you want Jake to win so much! It ends really, the only way it could. And it’s wonderful. It takes a talented author to have you read an entire book, of which you know the outcome of (hello, JFK died, we know he did) and still make it hard to put down. Paul Sheldon is the author of a best selling Victorian-era romance novels, the Misery series, named for its main character Misery Chastain. Paul had just finished up the final draft of his new (non-Misery) book in a hotel room in Colorado when he gets drunk and decides to drive to LA, hitting an unexpected snow storm. He loses control and his car plummets down a cliff. Paul awakes to find that he was rescued by a woman named Annie Wilkes, a former nurse with a seemingly unending supply of medical equipment and codeine painkillers. She’s set his horrifically damaged legs with splints; but when asked why he’s in her home and not a hospital she brushes off his question, vaguely blaming the weather and snow and assuring him she’ll get him to the hospital as soon as the storm clears. Annie eagerly informs Paul that she is his “biggest fan” and that his Misery novels are her favorites. Paul suffers at the hands of the dangerously unhinged and murderous psychopath that is Annie, torn between his fear and hatred of her and his occasional maddening thoughts of gratitude due to his soon-developed drug problem. He fears he will never escape and will die at the hands of Annie, who after discovering Paul killed off her beloved Misery in his last novel becomes increasingly erratic and violent. When Paul leaves his room. Afraid that Annie will leave him to fend for himself, as she did once before, Paul leaves his room find provisions and painkillers an afternoon that Annie is out of the house. Paul almost doesn’t make it back in time, and it's heart stopping terror as you urge Paul on while simultaneously trying to imagine what Annie would do to him if she saw him out of his room. When Annie hobbles Paul. Annie eventually finds out about Paul’s expeditions outside of his bedroom. To prevent him from escaping she “hobbles” him. It’s a scene almost too horrifying to describe, but it involves an ax and a blowtorch. Paul’s actual escape from Annie. This is a doozy of a scene. A lot happens, but in short we get a few “the murderer is dead….not really” moments that make you question the mortality of this terrifying woman. She’s almost Michael Myers-like; every time you think she’s a goner she rises up to try and get to Paul one more time. I cheated a little, because these three books are a trilogy and thus, three separate novels, but out of the three Mr Mercedes is by far my favorite and could be its own standalone novel. I’m listing them together because they are direct sequels and wrap together a larger story, so I encourage everyone to read all of them! I’m just going to go over Mr. Mercedes though, since it’s my favorite out of the three. Mr. Mercedes follows K. William Hodges (Bill), a recently retired police detective. With no purpose in his life since he stopped working, he is depressed and contemplating suicide. He’s also haunted by the last case he worked; a masked assailant drove a stolen Mercedes-Benz into a crowd of people waiting to attend a job fair. He wasn’t able to arrest anyone in association with the crime and it remains unsolved over a year later. The “weapon” used in the attack has caused the press and public to refer to the murderer as Mr. Mercedes. Bill begins corresponding through letters and internet chats with someone claiming to be the murderer. The information the individual drops brings Bill to realize that this disturbed individual is indeed the real Mr Mercedes. Bill becomes immersed in the case again, having found renewed purpose in his life. He is determined to catch the killer, even though it is illegal for him to act on his own due to his new status as a civilian. With help from his brilliant high school aged neighbor Jerome, Janey, the sister of the woman who’s Mercedes was stolen, and a few others, Bill works to find the Mercedes killer and stop him before another massacre happens; because Mr. Mercedes is hiding a lot closer than it might seem, and he’s got a plan. Mr Mercedes is another novel that’s not full-blown horror. King himself called it his “first hard-boiled detective novel.” Normally, books about police going after killers bore me to death. There’s too many of them and I don’t care about police procedures and office politics. But I’ve never read a detective novel like this one. Mr. Mercedes as a villain is so wonderfully wicked, so obsessively insane, but takes pains to appear so normal, that it makes you wonder who the people in your life really are and what they’re hiding. The opening scene, when you see the attack happen from the eyes of one of the victims. The slow march of dread weaves its way up your spine as the Mercedes appears and flicks its lights on the unsuspecting victims. When Brady, having failed to kill the dog but instead becomes indirectly responsible for killing his only family/friend in the world, decides he’s going to take care of Bill Hodges permanently, and when he least suspects it. This scene starts off terrifying and ends completely gut-wrenching, as Brady, again, fails to kill his intended target and kills a completely unexpected character crucial to the storyline. I literally remember my mouth hanging open the firs time reading this. Wonderfully written, and hard to get through due to the emotions. The ending of the novel, the final showdown between Bill, his partners in this investigation, and Brady. Just needs to be read to be believed. That’s all I’ll say. At one point maybe I’ll review the other two novels in the series. For Finders Keepers, you don’t have to read Mr Mercedes first. The main story deviates from the source material in Mr Mercedes, with only mentions of the events in Mr. Mercedes as a side plot. King describes the previous events pretty clearly to someone who may have picked up Finders Keepers before Mr Mercedes, but I still would recommend reading them in order. End of Watch, however, is a direct sequel to Mr. Mercedes so you definitely have to read that after Mr. Mercedes. Thinner is a classic King story, it has supernatural elements with a bleak ending. It’s also a little campy (and the movie based on this book from this is definitely more than a little campy.) King originally published this under his pseudonym Richard Bachman, which I love because one of his characters references himself and his work; “You’re starting to sound like a Stephen King novel.” I LOVE when he does that. I find it so funny. He does it in Mr Mercedes too, when he describes a clown mask as looking like “Pennywise”. It’s like, YES. Acknowledge how influential you are! Love it. Billy starts to lose weight, which at first is great, but when the weight loss doesn’t stop no matter how much he eats , t becomes worrisome. He’s losing several pounds a day, and quite literally becomes a skeleton of his former self. Visits to his two friends, the police chief that helped him and the judge that dismissed the case, reveal that they too, are suffering from mysterious and horrifying illnesses. This convinces Billy that he and the others have been cursed by the gypsy. Billy sets off on a journey up the East coast to track the gypsy tribe and demand the curse be lifted. He contacts an old friend of his, a man named Ginelli with questionable morals and known ties to the mob, with the hope that he can help. But Billy’s in a race against time, and convincing the gypsies to lift the curse might be harder than he thinks. When Billy encounters his old friend the police chief, and see’s the curse that’s been bestowed upon him. The anticipation is agonizing. And when we finally see it, it’s enough to make you nauseous. When he then heads to the judges house and has to try and explain his actions to at the judge’s distraught and crazed wife, hysterical with both rage and sorrow over what’s happened to her husband. Many of Stephen King’s full length novels are utterly terrifying, but he manages to hit the right scary notes a little more often in his short stories. Because of that, some of his short story collections and the tales they hold are some of his best work. (My opinion, obviously.) See below for some of my favorite Stephen King short stories. 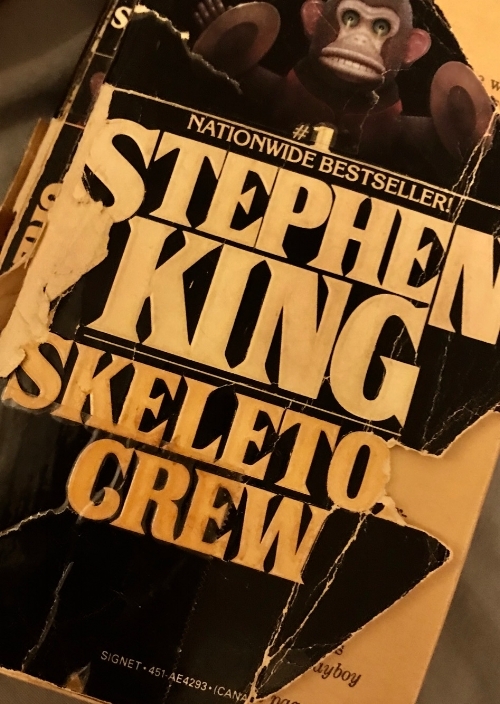 My very old, somewhat abused copy of Skeleton Crew. This is technically a novella. I’m sure a lot of people are aware of it from the movie as well as the TV show, but it’s a great story and, like always, very character driven. A man and his son get trapped in a grocery store as a thick mist rolls through town. They soon realize the mist is full of monsters and fight to survive among the other refugees in the store. Set in the future; teleportation has become a common way to travel and move goods. This is commonly referred to as “jaunting” A man by the name of Mark sits with his wife and kids in the Port Authority in New York City, preparing for their move to a colony on Mars. To entertain his kids, Mark tells the story of the discovery of teleportation and its subsequent effect on the world; and also why you must be put under anesthesia to jaunt. Four college students, two boy and two girls, get drunk and head to a favorite lake celebrate the end of summer. On the middle of the small lake is a floating wooden raft. Once on the raft, one of the boys, Randy, notices a circular oily object beeline toward the girls, narrowly missing them as they pull themselves up. At first, they all think it’s an oil slick or something organic, but when one of the girls accidentally touch it and gets pulled over, panic sets in. They’ve told no one where they are going, it’s October, they’re nearly naked, and something in the water is after them. I vividly remember reading this story for the first time. I had taken this collection out of my high school library and when I got home I plopped right on the couch to read this story. I was the only one home; my mom was at work and my younger brother wasn’t going to be home from until later, and the house was silent. Halfway through the story I sprang up and ran around turning on lights. This story creeped me out like no other short story has ever done..
Gary is a 9 year old boy gone fishing, and wakes to find a bee on the end of his nose. Gary is terrified of bees; his brother had recently died from a bee sting, and although Gary isn’t allergic to them he’s still afraid. He’s trying to decide on next moves when he hears a snap of fingers and the bee falls over, dead. He looks over and notices a tall, thin man wearing a three piece suit. As Gary converses with the man, he realizes that he’s speaking to the devil himself, and knows that if he doesn’t escape the devil will kill him. Richard Kinell is headed back to his home of Derry, Main from Boston when he stops at a yard sale. An unusual painting catches his eye. It’s of a man with a mouthful of sharp teeth, driving a convertible car over Boston’s Tobin Bridge. Richard is a horror author and loves unusual things, so he purchases the painting. But as he makes his way up to Derry, the painting changes, mimicking the route Richard himself is taking. Is it possible the man in the painting is real, and coming for him? Mike Enslin writes best-selling books about allegedly haunted locations, but the thing is he doesn’t actually believe in ghosts. For his next book he’s visiting haunted hotels, and has his sights set on the Dolphin Hotel’s notorious room 1408. The manager of the hotel does not want him let him stay, citing numerous unexplained deaths and accidents that have taken place in that room; but at Mike’s unwavering persistence the manager agrees. Mike Enslin doesn’t believe in the supernatural, but he just hasn’t spent the night in room 1408 yet. This post was a long, but thanks for sticking with me during the first Spooks Weekly! I’ll aim to put something out weekly for the entire fall season. Depending on how much I enjoy it I may make this a semi-regular series. I enjoy making other content that is not travel-focused because I have many interests, horror movies and novels being one of them!